Tapas, tapas, tapas. That’s what was on our minds as we landed in Barcelona and ventured out into our first night of food frenzy in Spain. And, our first taste of Spanish cuisine was several varieties of tapas, including some now-favorites patatas bravas and fried baby squid. However, as we wandered the streets of the gothic neighborhood after our first round of tapas, looking for something to keep the night going, we stumbled across a pintxos bar. Pintxos (or pinchos) are more popular in the basque region of Spain, but are also served in northern Spain (we had them in both Barcelona and Madrid, but did not run into a pintxos bar in Sevilla nor Granada). They are a type of tapas, but have a slice of bread on the bottom, and a toothpick through the entire thing. 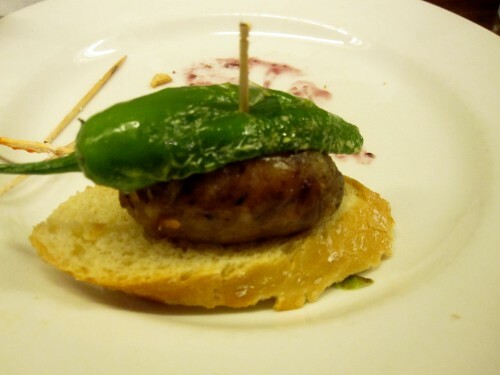 The picture to the right shows a pintxo with sausage and a pepper on top. At the pintxos bar we frequented in Barcelona, we were given plates and then we were able to fill them up with whichever pintxos we wished to try. Ordering the drinks was through the “bartenders,” but all of the food was chosen by us, at our pace. It was similar to the sushi bars with the conveyer belt – take what you want, and pay at the end based on the number of plates. However, unlike at a sushi bar, the pintxos were paid for based on the number of toothpicks you had on your plate. Also, each pintxo was worth the same amount – a couple of euros a piece. We found that the pintxos bars were less intimidating than the over crowded tapas bars. They provided a casual setting to eat a different type of tapa, and also allowed for instant gratification – no need to wait around and order! 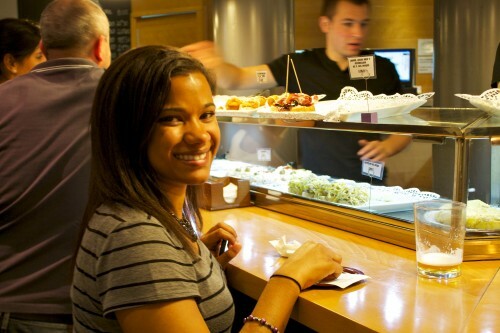 Even in Madrid, where the pintxos did have to be “ordered,” it was quick and painless. We just pointed or told them what we wanted, and the plate was handed to us. Both the bar in Barcelona and Madrid had plenty of counter space that was used for standing only. 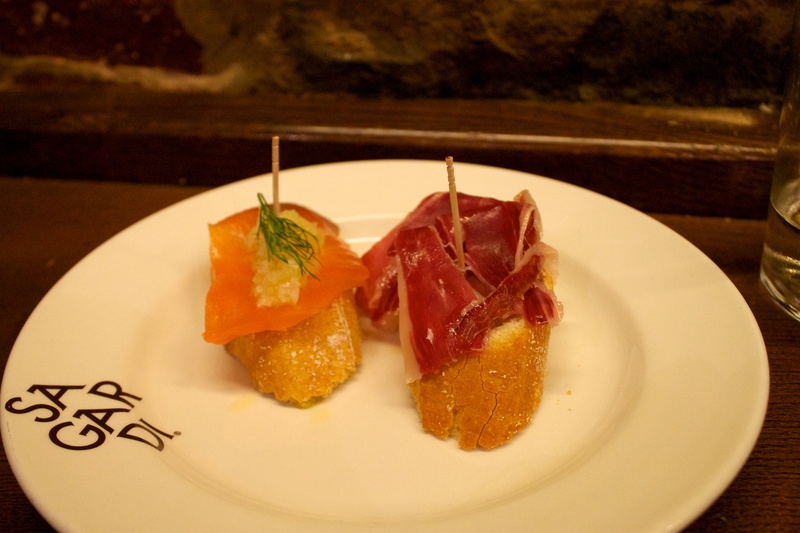 A few of our favorite pintxos were those with salmon, jamón, sausage, and anchovies on top. I’m so excited to have discovered pintxos, and can’t wait to research more about the best pintxos bars before our next trip to Spain! This entry was posted in Food, Travel and tagged Barcelona, food, Madrid, Portugal/Spain 2012 Trip, Spain by Kristin. Bookmark the permalink.